Fishing season 2019 has arrived! The Elite’s kicked off their season on the St. Johns River in Palatka, Florida February 7-10. Little did they know, near record weights would be caught at this season opener, with the biggest tournament bag weighing a 4 day total of 98 lbs.14 oz.– just short of one hundred pounds of bass! Rick Clunn won the event back to back from the last time the Elite’s were at St. Johns in 2016. 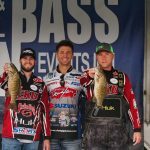 For the third year in a row, Chad Pipkens attended a one day bass fishing tournament for college and high school anglers. 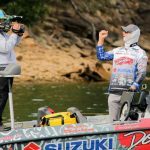 The event is put on by a fellow professional angler, Brandon Card, who also fishing on the Bassmaster Elite Series, and it is sponsored by Suzuki Motors. 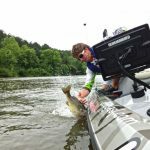 As the 2018 fishing season came to a close, Chad Pipkens was hunting for his berth to the 2019 Bassmaster Classic, which will take place Knoxville, Tennessee. Although he was just outside the cut in the Elite Series AOY points, there were two more opportunities ahead to qualify for the Bassmaster Classic that Pipkens was searching for: a first place in the AOY Opens Championship and top three at the Bassmaster Classic Bracket. 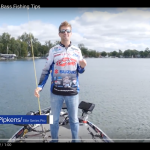 Check out this video featuring FlowRite Controls with Chad Pipkens providing fishing tips for the fall weather. 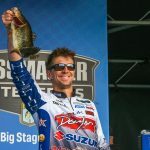 Going into the AOY tournament, Chad Pipkens was in 39th place, which put him on the “bubble” in qualifying for the Bassmaster Classic in March 2019. 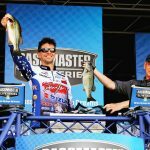 Out of the AOY tournament this year, the top 36 anglers in the points go to the Bassmaster Classic. The elites took their final regular season stop to the lovely town of Waddington, New York. Where exactly is Waddington you might ask? This quaint little town is on the border of Canada in upstate New York, sharing the St. Lawrence River as its dividing line. 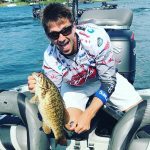 One of the greatest small mouth fisheries on the schedule for 2018 is Waddington, New York on the St. Lawrence River. In July 2017, the winning weight over the four day tournament exceeded 90 pounds, which showed just how spectacular this upstate New York body of water can be. 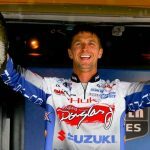 Chad talks with Seven Stripes Fishing about his experiences as a Bassmaster Elite Series angler and the road it took to get there. Dedication, hard work, and a couple of extra-curricular activities, like refereeing hockey and residential painting along the way, lead him to his professional fishing career. When it rains, it pours… bass!! 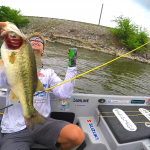 Although there were wet and rainy conditions at the Bassmaster Elite Event in La Crosse, Wisconsin, it didn’t stop Chad Pipkens from catching them. Check out the full article here. 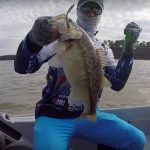 Chad Pipkens lands a giant bass that helps him earn 27th place at the Bassmaster Elite Series Event in Kentucky Lake, Tennessee. He catches a three day total of 47 pounds 3 ounces. With a final weight of 32lbs. 3oz. Chad earns himself 41st place and a good start to the 2018 fishing season.